Running at just over 90 minutes, the Kingdom of the Blue Whale is a very surreal and amazing journey about the lives of Californian blue whales as they travel to the waters of Costa Rica. This National Geographic documentary follows a group whale scientists and experts as they follow these gentle giants via satellite navigation and unlock some of their secrets such as their hidden breeding grounds. Apart from breeding, the documentary goes into some detail about their communication techniques, thanks to hydro acoustic microphones as we hear the majestic whale songs. 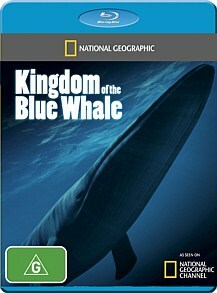 Add in other elements such as diet, migration patterns and this documentary covers a wide variety of facets of the blue whales. The most noticeable aspect of the Kingdom of the Blue Whale however is the mating rituals and calving practices of the blue whale and thanks to some impressive cinematography, it's almost like you are swimming with these creatures. The film is well narrated by Tom Selleck (Magnum) who does add an element of personality to the film and if you're a animal lover or an activist for these creatures, than this is definitely a must watch Blu-ray. The only drawback to the documentary is that at times, some segments feel a little disjointed and dare I say, a little lacklustre but for the majority of the time, it works quite well, especially with Selleck steering the ship. With a video resolution of 1080i (1.78:1), VC-1 codec, the most disappointing aspect of the Kingdom of the Blue Whale is the substandard video and audio quality and considering that this is a Blu-ray release, it's rather disappointing. As opposed to some other Blu-ray releases by National Geographic, the entire documentary seems upscaled from DVD as it is not as sharp or clear as many other Blu-ray discs. There is also a bit of artifacting with the picture quality but thankfully the content of the documentary more than makes up for this lacking feature. Audio supports Dolby Digital 5.1 which is nothing exceptional and is relatively clear throughout the entire presentation. In the end, Kingdom of the Blue Whale may be sailing into familiar waters but for the majority, it is an exceptional journey about these relatively unknown creatures and is very thought provoking!